Meguiar’s Ultimate Paste Wax features Meguiar’s ThinFilm technology, which makes it an easy to use wax. Even in full sun, the wax is easy to apply and remove. With one easy step, the formula delivers maximum synthetic protection, durability and reflectivity. This advanced, synthetic wax contains polymers that provide extended protection with amplified reflectivity and gloss. Meguiar’s Ultimate Paste Wax is a premium polymer wax providing the longest lasting protection, with the deepest, darkest reflections, a glossy wet look, and is safe on all glossy paints and clear coats. For best results with Meguiar’s Ultimate Liquid Wax, start with a freshly washed vehicle. Always use a pH balanced car wash soap like Meguiar’s Ultimate Wash & Wax. Next, run your clean, dry fingertips over the paint. If the paint feels rough to the touch this indicates that you have bonded contaminants on top of your paint. These are things like tree sap mist, industrial fallout, road tar, and paint overspray. Meguiar’s Smooth Surface Clay Kit comes with everything you need to safely remove contaminants bonded on the paint and leave it as smooth as glass. Finally, evaluate the paint for below surface defects. If you have light to moderate swirls, scratches, oxidation, water spots, or etchings you would want to use a product like Meguiar’s Ultimate Compound. From there you would follow with a polish like Ultimate Polish for maximum shine before applying your wax protection. One of the biggest mistakes people make when applying a wax is applying it too heavily. This only prolongs drying time, making the wax more difficult to remove and using more product than necessary. Always spread the wax very thin and evenly over the paint. For the easiest removal, use a clean, dry microfiber towel like Meguiar’s Supreme Shine Microfiber Towel (included in the box). 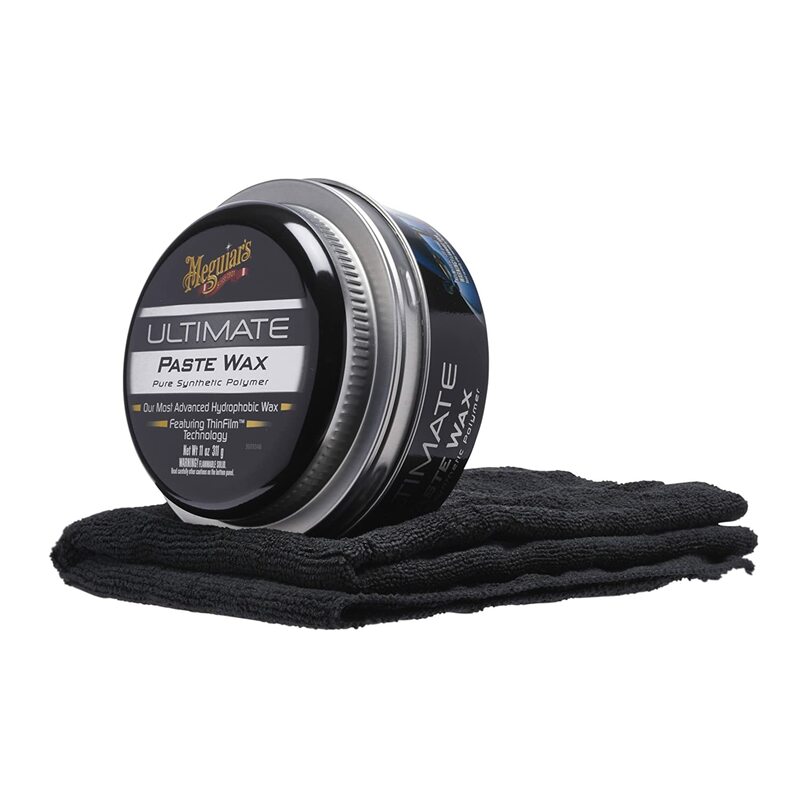 Please be aware that low temperatures and/or high humidity can prolong the initial curing time of Ultimate Wax. For best results, apply the Meguiar’s Ultimate Paste Wax in the shade to a clean, cool surface one section at a time. Allow 3-5 minutes of initial cure time before removing the paste wax. One way to tell if the wax is dry and ready to be wiped off is by performing a swipe test. Run an index finger across the wax and if the wax smears, it is not ready to be wiped off. However, if it’s a clear swipe, the wax is ready to be removed. Chemical Guys Butter Wet Wax is an all new and improved formula that delivers an unmatched surface shine and deep wet look. Butter Wet Wax goes on easier, shines brighter and lasts longer than previous generations. This improved blend of natural Carnauba, polymers, and resins leaves your car shining as if it were just washed. 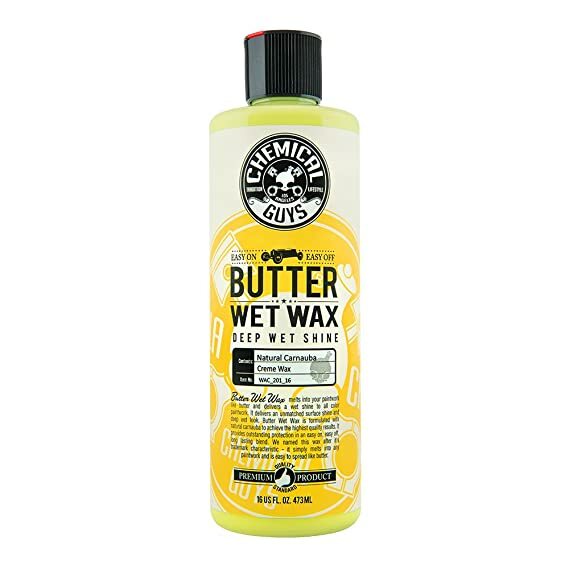 Chemical Guys Butter Wet Wax enables to attain the deep gloss of a paste wax in an easy on, easy off, long lasting blend. Butter Wet Wax is now even easier to use giving that amazing shine only their ultra refined, 100 percent carnauba based wax can provide. They named this wax after its trademark characteristic; it simply melts into any paintwork like butter. Chemical Guys Butter Wet Wax is simply stunning. Professionals and enthusiasts alike all around the world choose Chemical Guys Butter Wet Wax for its easy-to-use capabilities, extremely durable protection, and show winning shine that will look astonishing on most non-textured surfaces including, painted wheels, chrome bumpers, glasswork/windshields and stainless steel exhaust tips. Chemical Guys uses their all new signature, ultra-refined, carnauba formula creating a wax that utilizes the natural cleaning powers of carnauba to gently cleanse the paint, exposing the natural beauty of your vehicle’s color, while also providing a protective coating that will fight out the harsh effects of the elements. The smooth, protective layer is 100 percent natural to fight off water spots, bird droppings and road tar. The new improved formula of Butter Wet Wax is even more guarded against the suns harmful UVA and UVB rays. Your vehicle needs the best protection to fight off the harmful effects of driving. For best results with Meguiar’s Ultimate Liquid Wax, start with a freshly washed vehicle. The Meguiar’s Ultimate Wash & Wax is a great option to provide your car with the shine and protection it needs. Additionally, the Meguiar’s Smooth Surface Clay Kit can be utilized to remove any above surface contaminants ensuring a glass-like smooth finish. This also allow the wax to bond better to the paint for maximum protection. Don’t forget to have plenty of microfiber towels handy to gently wipe your vehicle down and leave it with amazing reflections and depth of shine. One of the biggest mistakes people make when applying a wax is that they apply it too heavily. This only prolongs drying time, making the liquid wax more difficult to remove and using more product than necessary. Always spread the wax very thin and evenly over the paint and allow it to cure for 3-5 before removal. For the easiest removal, use a clean, dry microfiber towel like the Meguiar’s Supreme Shine Microfiber Towel (included in the box). Please be aware that low temperatures and/or high humidity can prolong the initial curing time of Ultimate Wax. 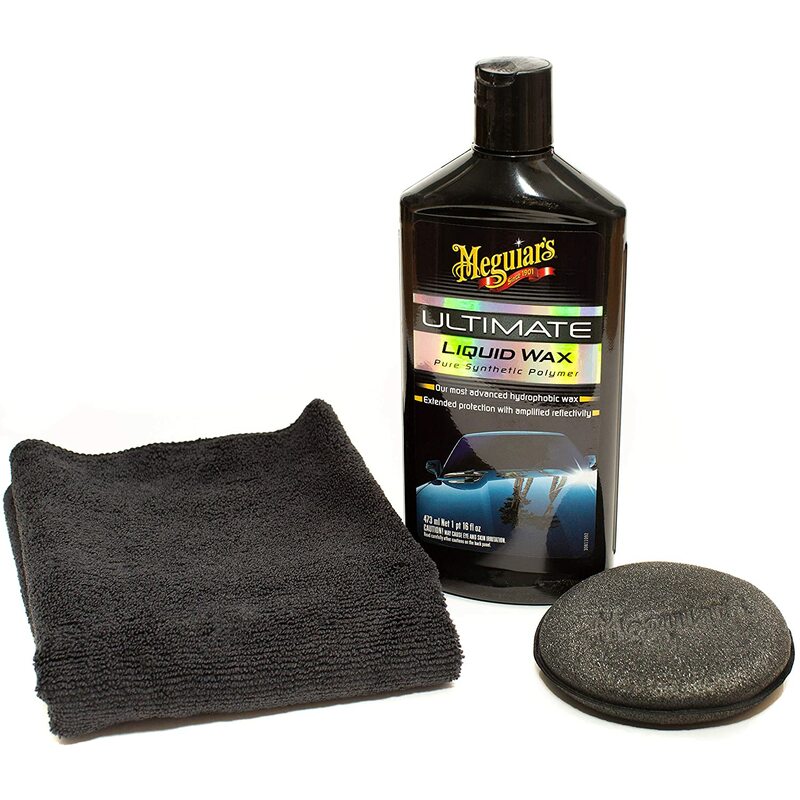 For best results, apply the Meguiar’s Ultimate Liquid Wax in the shade to a clean, cool surface one section at a time. Allow 3-5 minutes of initial cure time before removing the liquid wax. Quick Tip: One way to tell if the wax is dry and ready to be wiped off is by performing the swipe test. 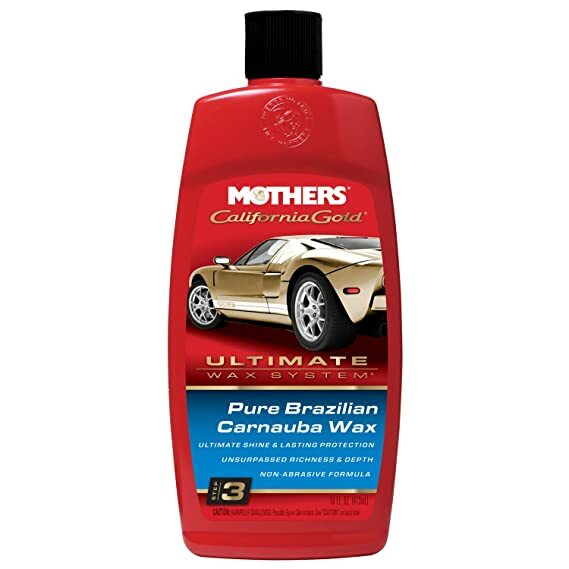 Mothers Pure Brazilian Carnauba Wax is the finishing touch to our Ultimate Wax System, delivering deep shine and lasting protection for all paints and clearcoats. While Steps 1 & 2 clean and smooth the surface of your paint for the ultimate in reflectivity, this final step in our process enhances and preserves the finish of your vehicle, and delivers the richness and depth you deserve.